There story strips were aimed at young children. Each one consisted of 10 image pairs. Each slide measured 33mm x 90mm and was printed on heavy gauge paper. 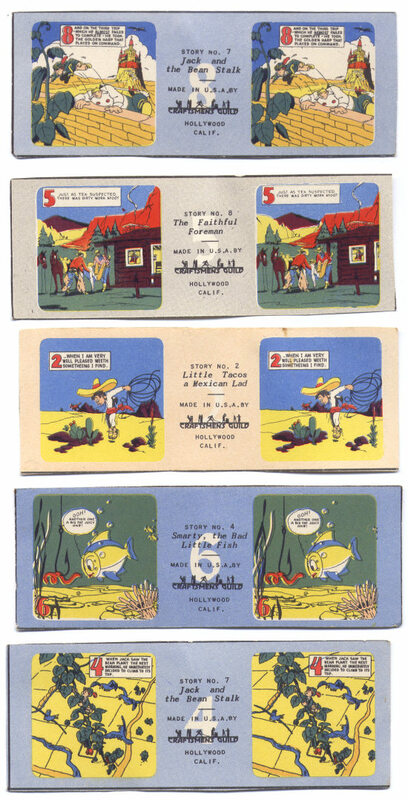 Story strip titles included, The Night Before Christmas, The Little Pig That Flew Just Once, Jack and the Bean Stalk, Little Tacos the Mexican Lad, Cinderella and the Glass Slipper, The Faithful Forman, Black Jack and Ramon, Smarty the Bad Little Fish, The Three Little Pigs and Ramos's Revenge. More may have existed. This viewer views stereo pairs that were in the '"Realist" format. The viewer had a thumb wheel located on the underside which allowed the user to focus to suit their individual eyesight. 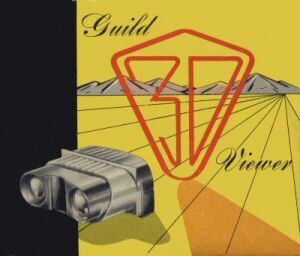 The viewer was manufactured by "Craftsmen's Guild" of Hollywood, California. It had large viewing lenses and good light collection, leading to a bright clear image. The lenses were made from lucite, a plastic with good optical qualities. Scans taken from the Guild Viewer Box.